It’s the time of year (or perhaps the end of the time of year) when zucchini is so abundant that people leave it in bags on your porch, hoping you won’t know who to blame. This has not happened to me, I don’t have a porch, but the (over)abudance of zucchini is real. If you’re looking for an alternative to your average zucchini bread, zucchini latke, roasted, sauteed, blended or fried zucchini, try these muffins. They’re sweet but not too guiltily so, and quite richly chocolate, with a little kick to spice up your life. 1. Grate the zucchini and set in a colander with 1/4 tsp salt to drain and pre-heat oven to 350F. 2. Measure out and mix all the dry ingredients. 3. Melt chocolate chips with 2 T vegetable oil and stir until smooth. Add the other 2 T vegetable oil, the egg and egg white, and mix until well incorporated. Mash bananas and add to the chocolate mixture. Add vanilla extract and orange zest, then mix. 4. Squeeze moisture from the zucchini and add to chocolate mixture and blend lightly. 5. 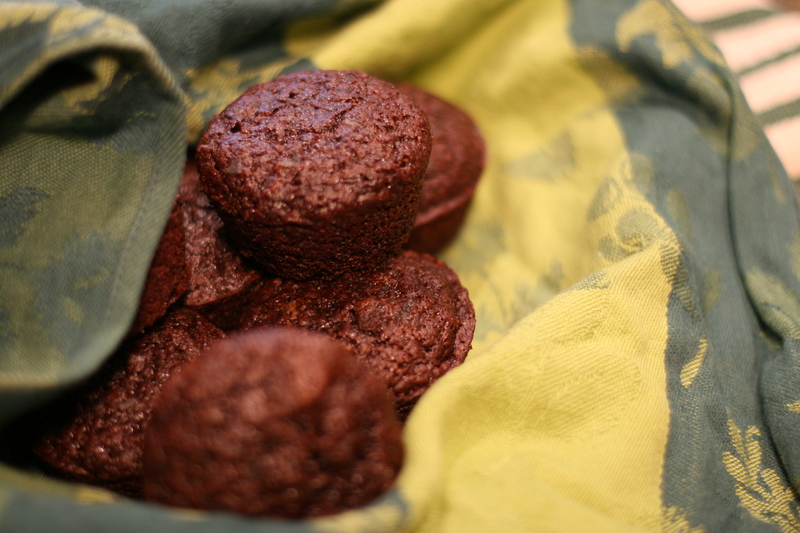 Oil a muffin pan, mix the dries into the wets until just incorporated and spoon into the muffin pan. Top with flake salt if available. Bake for 20 minutes.